The ID codes are the same as recognition codes for the wireless transmitter and the engine immobiliser function. Registering an ID code enables the smart key system, the wireless door lock control function and the engine immobiliser function to be operated. Code registration is necessary when the certification ECU (smart key ECU assembly), steering lock ECU (steering lock actuator assembly), or key is replaced with a new one. (a) Vehicles with the smart key system do not have a key slot. 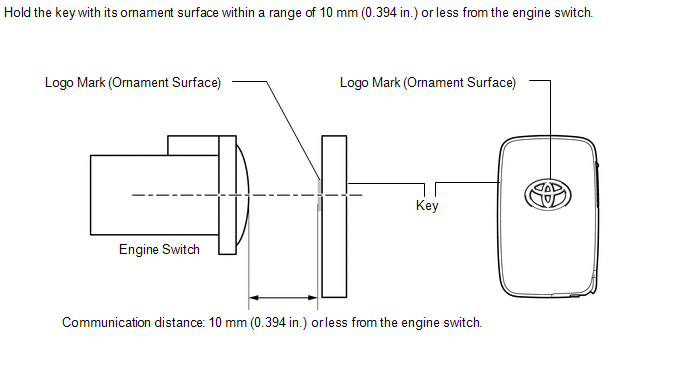 Therefore, hold the key close to the engine switch to register the key, as shown in the illustration. A maximum of 7 keys can be registered. After key ID erasure, any remaining keys that are not registered at this time cannot be used. Therefore, after key ID erasure, register all remaining keys. (a) The following table shows ECU replacement and key registration procedures for cases in which a malfunctioning ECU has been identified through the troubleshooting of the smart key system. If the customer has not brought all the registered keys, replacement of the steering lock ECU (steering lock actuator assembly) is also required. If some keys are not registered during the above steps, they will be disabled because they cannot be registered later. If key codes cannot be erased or additional keys cannot be registered due to a malfunction in the certification ECU (smart key ECU assembly), replace the steering lock ECU (steering lock actuator assembly) and certification ECU (smart key ECU assembly). If some keys are not registered during the above steps, they will be disabled because they cannot be registered later. The engine switch cannot be turned on (IG) more than 10 times. After connecting the Techstream, turn the Techstream on while turning the driver side door courtesy light switch on and off repeatedly at 1.5-second intervals or less to continue key registration procedure. Mode is automatically selected by the Techstream (new registration mode or add mode). *1: Repeat this process for each key which is to be registered for the vehicle. Finish the procedure for each key within 30 seconds. If the procedure for any of the keys has not been finished within the specified time, perform the registration procedures again from process 1. Make sure that only 1 key is in the cabin during the registration procedures. If 2 or more keys are in the cabin simultaneously, radio waves will interfere with each other, preventing normal registration. *1: Repeat this process for each key registered for the vehicle. Finish the procedure for each key within 30 seconds. If the procedure for any of the keys has not been finished within the specified time, perform the registration procedures again from process 1. If the key confirmation procedure for a key is performed, the security indicator light comes on and remains on until all the keys are confirmed. *2: Repeat this process for each key which is to be registered for the vehicle. Finish the procedure for each key within 30 seconds. If the procedure for any of the keys is not finished within the specified time, perform the registration procedures again from 1. Make sure that only 1 key is in the cabin during the registration procedures. If 2 or more keys are in the cabin simultaneously, radio waves will interfere with each other, preventing normal registration. *1: Perform this process for one of the keys registered for the vehicle. Finish the procedure within 30 seconds. If the procedure has not been finished within the specified time, perform the registration procedures again from process 1. Procedure "D" erases all registered key codes except one. Select the key that will not be erased. *1: Perform this process for one of the keys registered for the vehicle. Finish the procedure within 30 seconds. If the procedure has not been finished within the specified time, perform the erasure procedures again from process 1. Procedure "E" erases all the key codes registered in the vehicle. The ECU communication ID should be registered when the certification ECU (smart key ECU assembly) is replaced in order to match these ECU communication IDs. The engine cannot be started unless the ECU communication IDs match. After the registration, pressing the engine switch may not start the engine on the first try. If so, press the engine switch again. - Disconnect the cable from the negative (-) battery terminal for 30 seconds. (2) Turn the engine switch on (IG) and leave it as is for 30 minutes. (3) Turn the engine switch off and disconnect terminals TC and CG. (4) Check that the engine starts and stays running for more than 3 seconds.